These moths are so named because they fly, look, act and sound just like hummingbirds. ...but you have to admit, these guys are kind of cute. 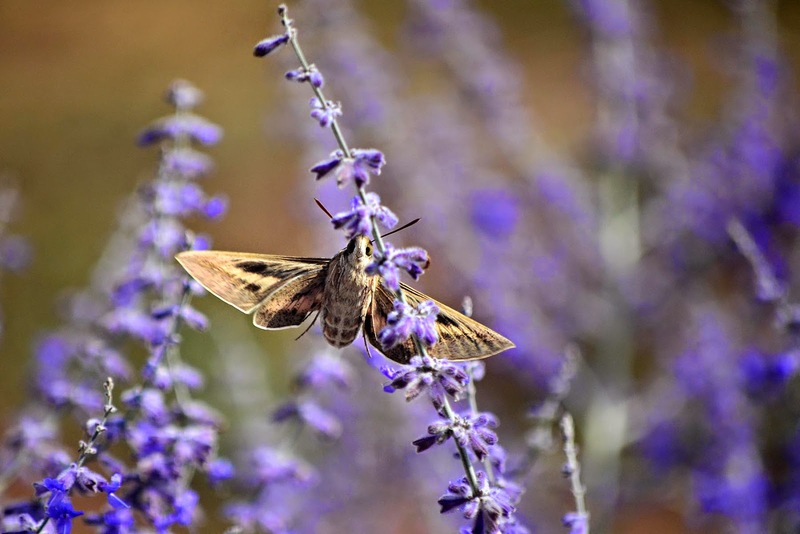 Beautiful Russian Sage. The hard winter last year took mine. Alas, I'll have to get another. When I looked at the first photo, I truly thought it was a photo of a painting. Stunning! Would it be redundant to frame the top picture? It's lovely. Your Russian sage is gorgeous too. So beautiful!!! I'm filled with photo envy. I've been feeding a group of about 14 or so hummingbirds on 8 different feeders but don't have the photo chops to take the pics. I was just trying to find a beginners class on photography on line before checking your blog for the day. Thanks for sharing your beautiful slice of country. I love Hummingbird Moths. They are so fascinating. We also have quite a few dragon flies this year. never seen so many before. That sage is beautiful! It looks very much like lavender. We don't get many hummingbirds. 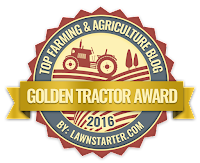 Maybe I need to grow something tastier for them. I only just discovered hummingbird moths a couple of years ago. Amazingly beautiful. 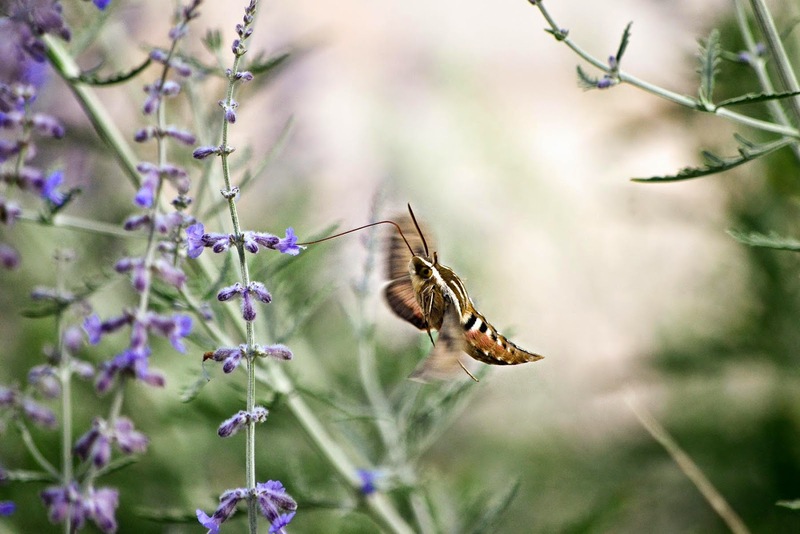 I used to see the hummingbird moths all of the time in Ohio but I saw my first one in Arizona last week. I agree with everyone else on that first picture. Gorgeous! We found a humming bird moth clinging to the door of the truck the other morning all I heard was, "Mom, help! There is a GIGANTIC bug!" Ahh....I needed a new picture for my government computer. The 1st picture is amazeballs. I love all the color contrasts. Sublime! Is that a tongue coming from that moth? 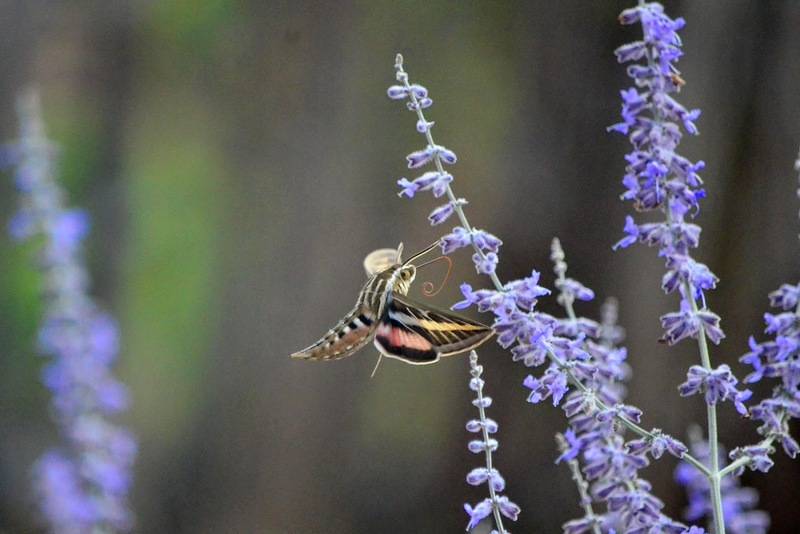 I have never seen a hummingbird moth. I have loads and loads of dragonflys and those creep me out, but their colors are so beautiful. 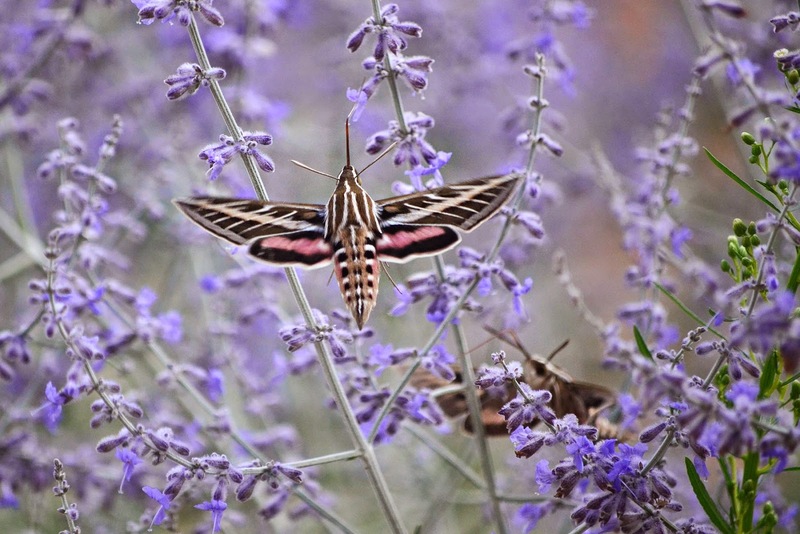 Wow - I'd never heard of the hummingbird moth - fascinating creature! 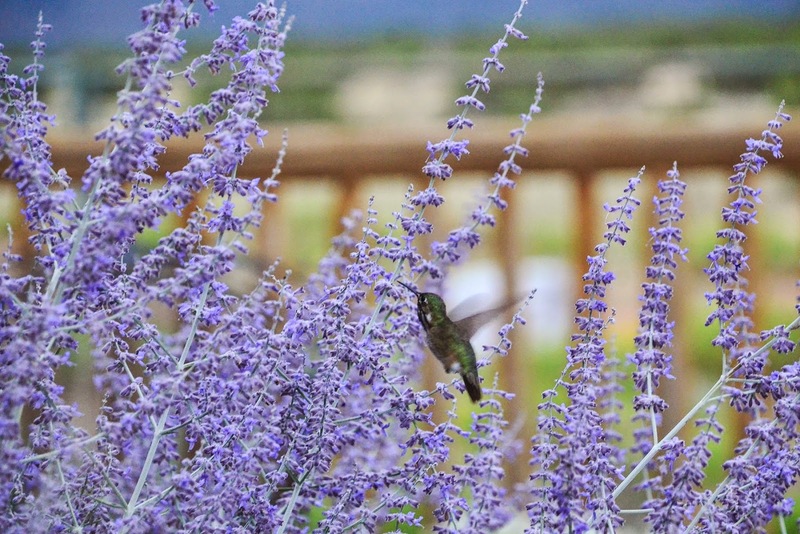 I also love Russian sage, which seems to grow well around here - I must add some to my garden. That first self-framed photo is gorgeous. Wait, they all are. 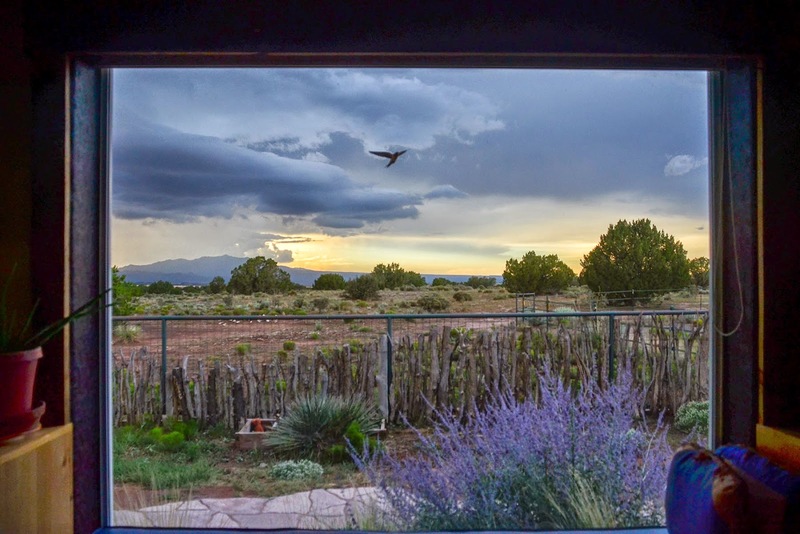 I admire anyone who can get a good shot of a hummingbird, never mind a whole post's worth. This is a magnificent photo of a White-lined Sphinx (Hyles lineata) Moth, who deserves to be admired as much as the Hummingbird moths! Thank you! Hummingbirds are my favorite. We have them here but wish we had more. We do everything we are suppose to do but we only get one or two a day...if that. Our neighbor has the same thing. Those moths are fascinating. Great photos. Thank you for letting me see them. What absolutely perfect photographs. Stunning. I seem to be having trouble leaving a comment on this post. Cyber space is not being kind to me. I'll give it one more try, (3rd time lucky and all that) simply because the photos in this post incredible. Carson, you have really outdone yourself this time. Your pictures are always entertaining and beautiful. Often they are stunning. But this post?! These photos are truly amazing! BEAUTIFUL!! The first photo looks like a framed picture!! I didn't know these little moths existed! I am the same as you, not a moth fan, but these are definitely cute!